By @SimonCocking. 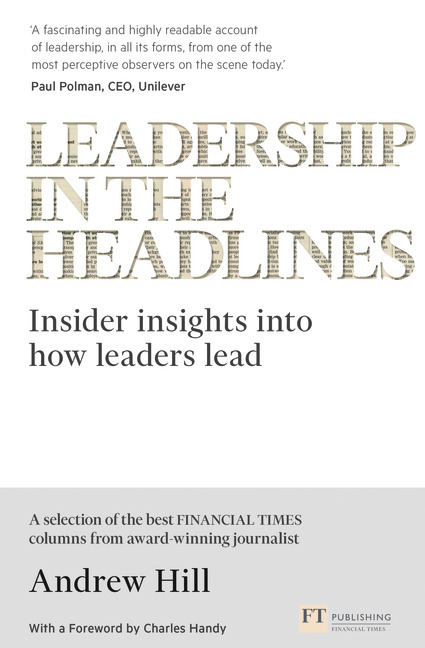 Review of Leadership in the Headlines: Insider insights into how leaders lead by Andrew Hill available from Amazon here. Good leaders walk a tightrope between doing and daring – often in the glare of the public spotlight. InLeadership in the Headlines, Andrew Hill, the award-winning Management Editor of the Financial Times, shares his insider insights into the who’s and how’s of effective leadership. Packed with practical lessons, this book divides the best of Andrew’s wry and insightful columns into eight ‘acts’ of leadership, with new commentary enhancing each one. This book is a compilation of a series of Hill’s articles for the FT, from the last five years. At times you wonder if this will work as by the nature of newspaper journalism articles are much more rooted in a particular moment in time. Fortunately they are thematically, rather than chronologically grouped so it does enable the pieces to create a deeper insight into the different topics covered. He has also written an introduction and analysis to each piece which brings more insights and value, especially on those pieces where, with the benefit of hindsight he has more interesting observations to bring to the piece. This works well, and helps to overcome what would otherwise be one of the limitations of a mere collection of articles written. The themes follow a logical progression in the time frame of a leader, from beginning the role, to managing challenges, to successfully (or not) exiting the role. From a UX perspective I found the black on grey choice of colours for the featured articles to be hard on the eye and not that enjoyable while reading, especially as the font also seemed to drop a size too. If there is a second edition this could be done differently hopefully. Overall though it is a good read, with useful, bitesized, informative insights, one for the Christmas stockings for the business leader in your life perhaps?